Lori Richardson has been a valuable member of our EMS team since 2006, when she joined us immediately after completing EMT school. She became interested in serving the community after getting married to Pafford paramedic David Richardson, who is also her ambulance partner. Lori is dedicated to serving patients in the Marianna community to the best of her ability, and she often follows up with people after the call. That might mean cooking and delivering meals to patients who are homebound, or dropping off medications for people who can’t get to the pharmacy themselves. She and David have delivered gifts to children after particularly rough calls and attended parties for patients they’ve grown close to. Lori is especially proud of her ability to reassure pediatric and psychiatric patients and to have a positive impact on their lives. As an FTO, Lori helps prospective EMTs understand the challenges and rewards of the job. She also helps other crew members to ensure the units are properly cared for and supplies are stocked. Her efforts have not gone unnoticed—she has been honored with the Road Warrior and #Pafford Strong Team Member awards. Off-duty, Lori is continuing her education, working toward a veterinary technician degree. She and David volunteer at local animal rescue organizations and visit nursing and foster homes with their dogs to provide comfort to residents. Lori and David Richardson have earned the trust of their whole community because of their sincere care-giving “after the call.” They also enthusiastically advocate for our company and EMS, and that fills the Pafford leadership team with pride. We are very grateful for this wonderful couple, whose knowledge, skill, and dedication mean their friends, neighbors, and our company are so well served. 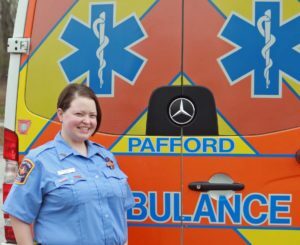 The Star of Life designation is deserved by Lori and David, and it reflects the appreciation everyone at Pafford has for their past, current, and future efforts.